SABAH'S largest property developer, Hap Seng Consolidated Bhd, aims to buy more land and buildings in Peninsular Malaysia to grow its property portfolio, a company source said. The company is eyeing a few commercial properties within the Kuala Lumpur city centre area and land in strategic areas within the Klang Valley. "Hap Seng is still in negotiations with the parties concerned. It will acquire only if the price and location is right," the source told Business Times. 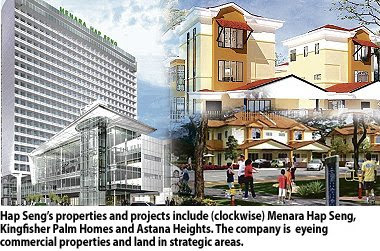 Hap Seng's first property acquisition in the Klang Valley was Menara Hap Seng (previously MUI Plaza) and the adjoining land, which it bought from MUI Properties Bhd for RM190 million in 2004. It also bought 30.88ha of leasehold land in Puchong to develop D'Alpinia, a low-density and gated development. Developments have started at D'Alpinia, its first high-end mixed-housing project outside of Sabah. It features terrace homes, semi-detached units, townhouses, bungalows, condominiums and commercial units developed under a build-then-sell concept. Hap Seng is due to launch phase 1A, comprising 154 units of terrace homes and semi-d's, in the second half of this year. "The units are almost completed and will open for sale from the third quarter. Hap Seng is optimistic due to high registration for the properties. Demand will accelerate as there has been no major supply of new products in the market," the source said. 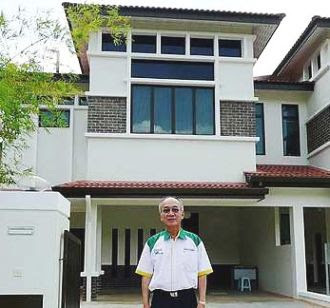 Hap Seng's other projects are the Kingfisher Palm Homes, featuring terrace houses, semi-detached homes and bungalows in Kota Kinabalu; Bandar Sri Perdana, a 62.5ha mixed-development in Lahad Datu; and Bandar Sri Indah, a 342ha self-contained township in Tawau. KUALA LUMPUR: Property developer and plantation owner Hap Seng Consolidated Bhd is still looking to acquire commercially viable properties or land in the central Klang Valley despite the slowdown in the economy. It wants to repeat its success with the 22-storey Menara Hap Seng (formerly MUI Plaza), which the company acquired from MUI Properties Bhd for RM190 million in 2004 and which is fully tenanted after a RM60 million refurbishment that was completed in December 2007. Hap Seng Land Sdn Bhd chief executive (property division) Datuk Paul Ng Jee Seng said at a media briefing Tuesday that the company has good credit facilities and cash reserves to acquire properties or land in the Klang Valley. Hap Seng Land is a wholly-owned subsidiary of the company. Ng had said in earlier reports that the company was pursuing property development in the niche segment for the Klang Valley compared to developing affordable housing in Sabah, where it is the state’s largest developer. He added that rental rates for office space in Menara Hap Seng was between RM5 psf to RM6psf while for retail space, it stood at RM5 psf to RM20 psf depending on location. Besides Menara Hap Seng, the company has 76.30 acres of leasehold land in Puchong where it is developing landed property. JOHOR BARU: Selangor-based Nusa Utama Sdn Bhd is banking on the strategic location of its Taman Laguna @ Sg Danga scheme in Danga Zone as the main selling point of the project. An added attraction was that Danga Zone was slated for upscale property development in Iskandar Malaysia, said director Soon Hoe Chuan. Overlooking the Straits of Johor on a 30.756ha site, Taman Laguna occupied the last plot available for residential development near Sungai Danga, he told StarBiz. “More people are looking for properties in the Nusajaya area as it will be the key growth centre in Iskandar region,’’ Soon said. He said the project was easily accessible from the Johor Baru city via the Perling Interchange and just a few kilometres to Singapore via the Second Link crossing. Soon said the scheme would get a further boost with a new 30.6km coastal highway linking the Johor State New Administrative Centre (JSNAC) and the city. The six-lane highway, for which construction would soon start, is expected to ease traffic flow between the city centre and JSNAC in Nusajaya. Taman Laguna was started at the end of 2006, offering double-storey super-link houses with lot sizes of 26ft by 80ft and 28ft by 90ft, and prices ranging from RM273,955 to RM568,300. Phase one comprising 110 units was sold out and completed. The owners are expected to move in soon. This is Nusa Utama’s second project in Johor. Its first was the 31.97ha Taman Nusa Perintis in Gelang Patah that started in 1999 and was completed in 2004 with a gross development value (GDV) of RM220mil. Soon said Taman Laguna would be completed in the next eight to nine years comprising 500 double-storey terrace houses with a total GDV of RM270mil. “We decided to introduce bigger houses as buyers of landed properties here prefer bigger built-up areas and smaller land space,’’ he said. Property developer Mah Sing Group Bhd is mulling over plans to build hotels and resorts in Kota Kinabalu, a project pegged on Sabah's reputation as a tourist attraction. It is learnt that the company may build four- and five-star hotels, a resort and houses that will command a gross development value of around RM1 billion. Mah Sing is mulling developing the properties with private landowners in Sabah, but it will hold majority stakes in the venture, a source said. Company officials who spoke on condition of anonymity said the plan for a tourism project in Sabah is still preliminary. "We are happy to explore all possibilities, but our plate is currently full with 16 projects," the official said. The 16 projects are in Penang, Johor and in the Klang Valley, lasting it another five years. The remaining GDV and unbilled sales is RM3.9 billion. The proposed Sabah project comes at a time when the state's tourism sector is booming despite a slowing economy. There are only a few hotels and resorts in Sabah to accommodate for the expected higher growth. Sabah's projection for 2010 is 3.4 million visitors, with tourism receipts exceeding RM6.5 billion. Chief Minister Datuk Seri Musa Aman said last year that the growth in tourist arrivals per year in Sabah is projected to be above 20 per cent over the next five years. According to statistics by the Sabah Tourism Board, the state received 2.48 million visitors in 2007, a fivefold increase over 1998's figure of about 400,000. For the 10 months to October 2008, it had 1.88 million visitors. SYDNEY: Australian house prices fell last year as tightening credit conditions and a sharp downturn in the economy put paid to the double-digit growth enjoyed in 2007, dealing a further blow to household wealth and pointing towards more rate cuts. Government data out yesterday showed prices of established houses fell 3.3% in the fourth quarter compared to the same period in 2007, when they were running hot at 14%. The drop in wealth, already undermined by sliding equity and pension values, only added to expectations of another big cut in interest rates when the Reserve Bank of Australia (RBA) holds its monthly policy meeting on Tuesday. Investors are pricing in a cut of 100 basis points in the key cash rate to a record low of 3.25%, bringing its easing since September to a massive 4 percentage points. “The news has been so dismal that they almost have to cut by 100 basis points, and an even bigger move can’t be ruled out,” said Michael Workman, a senior economist at Commonwealth Bank. The Australian government is also expected to announce a second package of fiscal stimulus measures, perhaps as soon as this week, in an attempt to limit any rise in unemployment. Prime Minister Kevin Rudd told a news conference the government would “move heaven and earth” to support the economy even as the global recession blew a hole in its tax take. Warning of a return to budget deficits after years of plenty, Rudd said tax revenues over the next four years were expected to be lower by a staggering A$115bil (US$73bil). That is equivalent to over a third of annual tax revenues, or 10% of gross domestic product. “But this government will leave no stone unturned when it comes to taking all necessary measures to continue to support growth and jobs,” he said. The depth of the trouble was illustrated by a monthly survey of 200 manufacturers, which showed activity contracted for the eighth straight month in January. The Australian Industry Group/PriceWaterhouseCoopers Performance of Manufacturing Index (PMI) edged up a seasonally adjusted 2.9 points to 36.6, but remained far below the 50 threshold separating growth from contraction. The steep cuts in interest rates seemed to be offering some support to house prices as the pace of decline slowed on a quarter-to-quarter basis. Prices dipped a smaller-than-expected 0.8% in the fourth quarter, compared to the third quarter when they sank 2.4%. In any case, the annual losses of 3.3% in Australia are relatively modest compared to declines of 15 to 20% suffered in the United States and Britain. This was partly thanks to still high levels of skilled migration and a rising population. There are also far fewer unsold homes in Australia, which had never gone though the huge building boom that left so much stock in the United States. Monetary policy was having more of an impact as the main variable mortgage in Australia is benchmarked off the central bank’s cash rate, unlike in the US where the most popular fixed rate mortgages are tied to Treasury yields. Rory Robertson, interest rate strategist at Macquarie, noted that the headline variable mortgage rate had fallen to around 6.85%, from 9.6% before the central bank began easing. PETALING JAYA: Analysts see a positive outlook for the domestic construction sector this year and expect selected construction stocks to be ripe for a re-rating in the coming months amid the implementation of “mega projects” under the Government’s stimulus packages. CIMB Research has a “trading buy” call on the sector, mainly due to attractive valuations and on expectations the construction sector will recover via pump-priming activities by the Government, including a second stimulus package worth RM7bil to RM10bil. “Even if our worst-case scenario forecast of a 0.5% GDP (gross domestic product) contraction this year pans out, it is unlikely that the construction sector growth will deteriorate to the extent that it did during the 1997 to 1998 Asian finacial crisis,” an analyst with CIMB Research said. “Besides the planned implementation of the second stimulus package, newsflow on the progress of outstanding jobs worth RM61bil and weakening building material prices should arrest margin decline.” From Jan 8, 2008 to Dec 8, 2008, the Construction Index plummeted 48% to 164.2 points, exceeding the 39% drop in the KLCI. Over this period, share prices of Malaysian construction stocks plunged 57% on average, hit by a slew of events such as the 18% to 26% increase in electricity tariffs, a steep 20% to 30% rise in the prices of building materials, and a whopping 40% rise in petrol pump prices. Another local analyst agrees that the time is right for a recovery in the construction sector as the Government tries to boost economic growth by pouring funds into “mega” construction projects. “But to have a positive and significant impact on the construction sector, the funds must be channelled in quickly and mega projects started as soon as possible to boost the sector’s growth,” he said. The analyst said the spotlight would be on high-impact mega projects that could help support employment and the economy. “The speed of development of mega projects like the transportation upgrade including the West Coast Expressway (which cost more than RM3bil), Pahang-Selangor water transfer tunnel (RM3.8bil), Langat 2 water treatment plant (RM5bil) and the Bakun power transmission line will be closely-watched,” he said, adding that about RM61bil had been allocated for these projects. Nevertheless, he acknowledged that market conditions were still tough for the construction sector. “Players in the construction sector now have difficulty raising funds to finance projects, especially larger projects because of the credit squeeze by financial institutions as they are more cautious in their lending practices due to the global economic downturn,” he said.